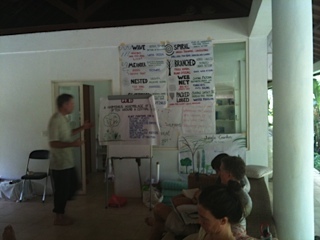 From Febuary 24th to March 12th we held our first Permaculture Design Certification Course at Jiwa Damai.The group consisted of 30 participants coming from India, Australia, USA, Germany, Austria and Bali. The internationally renowned teachers Rico Zook and Jeremiah Kidd did a great job in teaching the class. One part of the PCD course was theoretical learning in the 'classroom'. Here the participants are introduced to the various flows in nature. The other part was practical hands-on-experience in the organic garden. Here our group is learning to measure the PH content of the soil. During the 16 days course the participants were instructed to create IMO, indigenous microorganisms, using bamboo, cooked rice and sugar. This mixture needs to ferment for 4 days and then this fungus can be used to fertilize compost to create a larger stock. These are some hand-made measurement instruments to properly measure size and topography of a land.